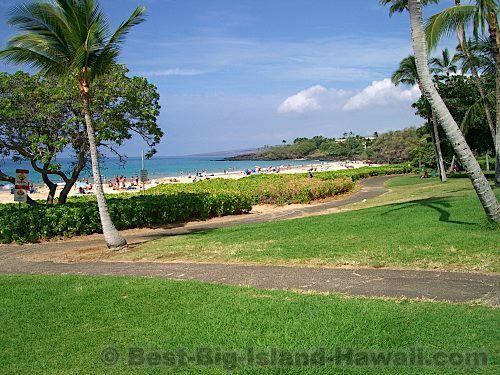 Hapuna is the largest and most classic beach on the Big Island of Hawaii. It's often listed by travel magazines and TV shows as one of the best beaches in the United States. 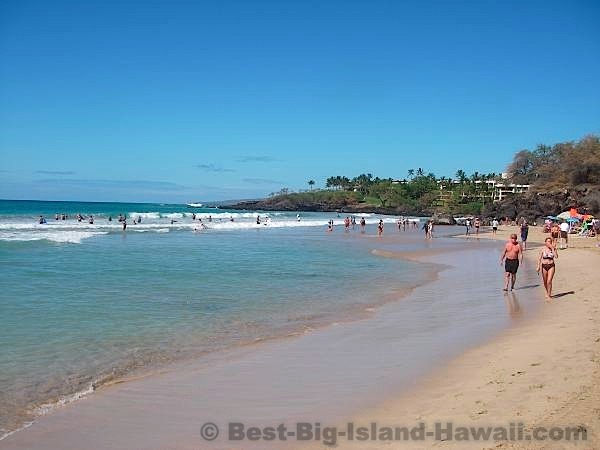 So, if you're looking for that long sandy beach from your Hawaii dreams, Hapuna is it. Hapuna is about half a mile long and 200 feet wide (at it's widest). At the north end of the beach is the Hapuna Beach Prince Hotel. Most of the beach is adjacent to the public access area of the state recreation area. 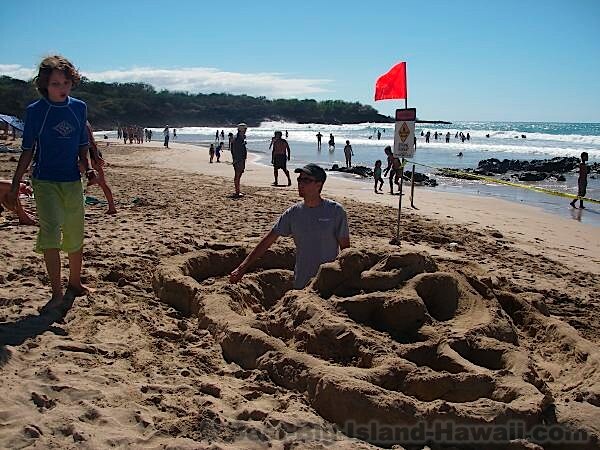 Unlike Mauna Kea Beach, where public access is controlled by the hotel, access to Hapuna is very easy. The entrance to the public beach park is right about at mile marker 69 on Highway 19. The next entrance up the road is the hotel entrance. From Kailua-Kona it's about 30 miles North and takes about half an hour (if the traffic isn't too bad). Once you get there, you'll realize that Hapuna is well worth the drive from Kona. This beach is absolutely perfect for swimming and all your favorite beach activities like frisbee, volleyball, soccer and sandcastle building. Bodyboarding is great when the surf is up but not too high. When the surf is big, it's best to stay out of the waves unless you know what you're doing as they will thrash you. The hotel is tucked away at the north end of the beach, so it doesn't feel like it dominates the area. The whole beach is public access, so don't feel like you're trespassing if you're at that end of the beach. The beach chairs at the hotel end, however, are only for hotel guests. Hapuna is the perfect spot to spend the day and it's a beach that you'll likely keep coming back to. Bring you cooler, pitch your umbrella and start making tough decisions—such as, "Should I swim now or should I lay out in the sun?" ... Life is tough at the beach!